Scalable Industrial Degassing of compounds/substances in 55-gallon batches. Degassing and mixing of liquids under vacuum improves product quality and increases the efficiency of degassing and impregnating of substances. Allows you to apply tons of force in a vacuum chamber. 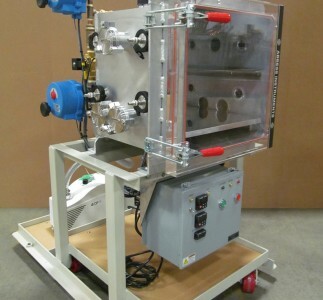 We designed a standard 5-gallon vacuum chamber mixing unit to streamline the ordering process. Mixing can greatly improve the degassing operation of almost all materials; it is a must for thicker materials like pastes and gels. 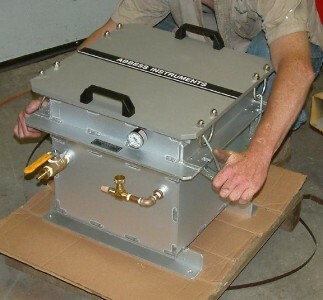 This bench top sized vacuum chamber is designed to be a rugged production or testing unit. Some of our customers find this to be a practical size for use in vacuum degassing small batches of resins, epoxies,other liquids, or filling molds and other containers under vacuum. Some of our customers find this vacuum chamber to be a practical size and shape for use in vacuum degassing liquids and soilds, EMI and altitude testing electronics, research, and development. 11 inch or 15 inch diameter by 6,12 or 20 inch deep vacuum chamber with hose, vacuum pump, fittings, valves, and gauge. 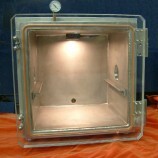 This chamber is used for vacuum drying samples and other material processing where temperature and time are critical. This Thermal Vacuum Chamber System allows items placed inside to be contained in a high vacuum environment to facilitate customer process production requirements . The entire thermal vacuum chamber system can be controlled manually, by starting/stopping the pump(s) and opening/closing valves. The chamber shown was custom designed and fabricated working together with our customers to meet their demanding process requirements. The piece is comprised of the clear acrylic view cylinder with PTFE non-stick coated aluminum plates and all stainless steel fittings. 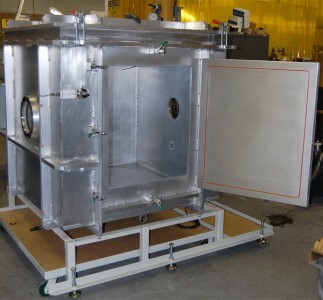 These vacuum chambers are designed to be rugged production or testing units for each customers’ unique requirements. ￼￼￼The Abbess Thermal Vacuum Custom Gas Mix System allows articles under test placed inside the chamber to be exposed to high vacuum pressure as well as various temperatures via a heated and cooled Main Thermal Plate Assembly. 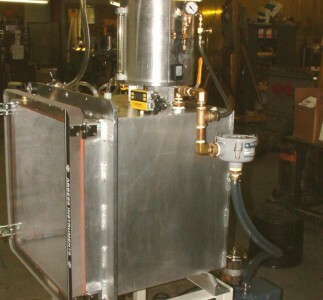 A custom-designed vacuum system configured to top-load large scale parts into a solution for cleansing/dring/degassing. 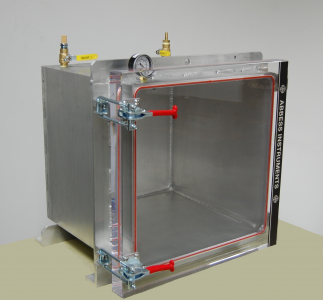 These vacuum chambers are in-stock chambers ready for immediate shipment. Next day service available. 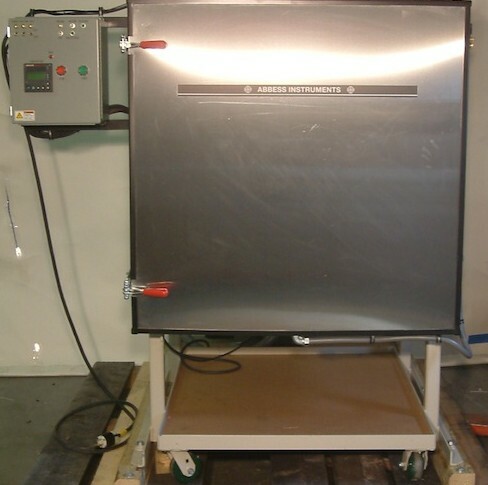 These Vacuum Oven Systems are designed and built to be rugged and efficient systems for use in production or testing. Doors open on the top and side of the camber. Windows look onto a rotating turntable within the chamber. LED lights illuminate the interior. 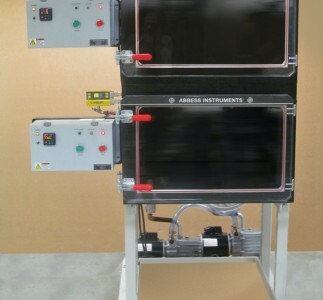 Abbess Instruments has carefully designed three-levels of Altitude Chamber vacuum systems of varying complexity. Listed are standard packages with can be bought as a bundle, or can be customized to fit certain specifications. This custom high vacuum chamber with thermal inserts is capable of being used as a large-scale space simulation/thermal vacuum chamber. This Dual Altitude Chamber System has two separate chambers that function and are controlled independently. This system a facilitates the user to conduct and monitor separate or parallel tests. This 48 inch cube system (thermal vacuum chamber) allows items placed inside to be exposed to vacuum down to 10^-7 Torr. A Vacuum Cycle Controller (VCC) is used to automate control functions. The Abbess Thermal Vacuum Chamber System shown allows Article(s) Under Test placed inside to be exposed to high vacuum (10e-8 range) as well as heated and cooled via conductive contact with the Gold Plated Copper Thermal Plate. This in-line vacuum chamber allows an assembly line to go through this vacuum chamber by way of a two-door entry points. This bench top sized vacuum chamber is designed to be a rugged unit with 1-1/2″ thick walls and true o-ring seals for deep vacuums and long life. Dry in our manual or automatic, data-logged or not, single or multi-chambered, Vacuum Oven systems. Our standard vacuum chamber is a 24 inch Cube, 24″ high x 24″ deep x 24″ wide, a practical production size for use in vacuum degassing of liquids, plastics resins, and epoxies. These vertical sliding doors allow for easy access to the interior of your next vacuum chamber system even in confined spaces. Vacuum infusing, Vacuum impregnating, and Vacuum filling can greatly improve the Product Quality of 3D printed items. Achieve dry, and controlled conditions for your items and batches with our process-versatile, multi-access, multi-functional, with a optional automated chamber controller and data logger. This Vacuum System allows items placed inside to be exposed to specific vacuum levels and rates of change. A Vacuum Cycle Controller (VCC) is used to automate control functions. The VCC enables system monitoring and control via touch screen buttons and graphic indications of sensor data registered and controlled by a PC with a user-specific Graphical User Interface (GUI). The tall size of the altitude chamber allows sample carts to be wheeled in with ease. By being able to load the chamber efficiently, it is easier to subject the product sample process to various altitudes. The operable clear acrylic port provides quick and easy access to a test system without needing to unclamp the larger door. The Abbess Thermal Vacuum Chamber System shown facilitates thermal and vacuum profiles consistent with altitudes to 200K feet. Customer defined devices are supported with an array of 25 pin D-sub, BNC and SMA feedthrus. 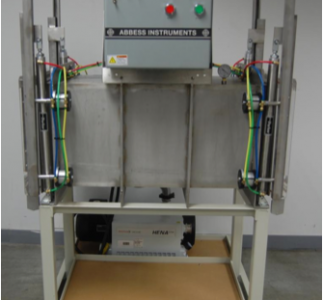 This system allows articles under test placed inside to be exposed to high vacuum pressure as well as various temperatures via the heated and cooled Thermal Plate Assembly. A Thermal Vacuum Cycle Controller (TVCC) is used to automate and control functions. Replicate atmospheric conditions within the vacuum chamber system. 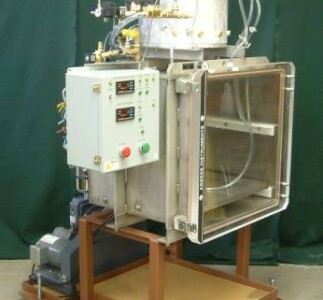 This vacuum chamber sytem is ideal for space simulation testing. 6 heated and cooled thermal plates. The Thermal Vacuum System allows items placed inside of the thermal vacuum chamber to be exposed to vacuum as well as heat or cooled via the Thermal Plate. Custom Top Loading Chamber with Lateral Sliding Door Action was produced in answer to a customer’s very specific requirements, and on an accelerated timeline. 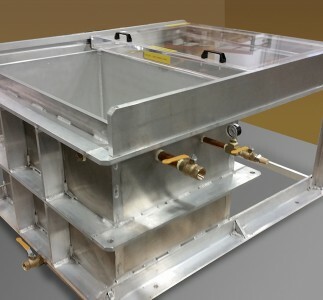 This Vacuum Cold Trap is designed to precipitate vapors like water and related materials from gas streams developed in a vacuum processing or drying operation.